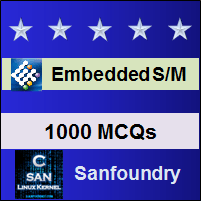 This set of Embedded Systems Multiple Choice Questions & Answers (MCQs) focuses on “Processor of Embedded System”. 1. Which one of the following offers CPUs as integrated memory or peripheral interfaces? Explanation: Microcontrollers are the CPUs which have integrated memory and peripherals but microprocessor possesses external chips for memory. 2. Which of the following offers external chips for memory and peripheral interface circuits? Explanation: Microcontrollers are the CPUs which have integrated memory and peripherals whereas microprocessor offers external chips for memory. 3. How many bits does an MC6800 family have? Explanation: MC6800 is an 8-bit processor proposed by Motorola. 4. Which of the following is a 4-bit architecture? Explanation: National COP series is a 4-bit processor whereas MC6800 is an 8-bit processor, 8086 is a 16-bit processor and 80386 is a 32-bit processor. Explanation: It is complementary to RISC architecture and has complex instruction set compared to RISC architecture. 6. How is the protection and security for an embedded system made? Explanation: Intellectual property right provides security and protection to embedded systems. 7. Which of the following possesses a CISC architecture? Explanation: MC68020 is having a CISC architecture. CISC architecture is used for code efficiency whereas RISC architecture is used for speeding up the processor. ARC, Atmel AVR, and Blackfin are RISC architectures. 8. Which of the following is a RISC architecture? Explanation: MIPS possess a RISC architecture whereas 80386, 80286 and Zilog Z80 are CISC architectures. 9. Which one of the following is board based system? Explanation: VMEbus is Versa Module Europa Bus which is used as a board based system for easy manipulation. VMEbus is a computer bus standard developed for the Motorola MC6800 family and is mainly based on Eurocard sizes. Explanation: A computer bus standard in Eurocard sizes mainly developed for Motorola MC6800 family and later on used in many applications and approved by IEEE.